1. What is the Montessori Method? The Montessori Method, named for its founder Dr. Maria Montessori, approaches education by emphasizing the potential of each child and developing it through prepared environments of uniquely designed learning materials under the direction of trained Montessori teachers. Maria Montessori felt that the goal of education should be the cultivation of the child’s own natural desire to learn. It is a psychologically rooted method that takes the developmental needs of the child as the basis and foundation for learning. 2. How are the classes structured? South Suburban Montessori School educates children from 18 months to 14 years of age. The multi-age groupings are: The Toddler Classroom, 18 months to 3 years; The Children’s House, ages 3 to 6 years; The Lower Elementary, ages 6 to 9 years; the Upper Elementary ages, 9 to 12 years and the Middle School, ages 12 to 14 years. 3. How does the classroom work? Each classroom is a designed environment, including developmental learning materials and sequential activities meant to be experienced over a three year cycle and not in individual successive one-year capsules. The classrooms are child centered compared to adult centered classrooms in a traditional setting. A trained certified director is an integral component of a well functioning prepared environment. Children are allowed the freedom of choice and movement, and learn respect for themselves and for others. Multi-aged classrooms, the hallmark of Montessori programs, help develop a sense of community and encourage cooperation and collaboration. Younger children learn from older ones, and older children reinforce their learning by teaching concepts they have mastered. Children can progress at their own pace and level of understanding. Each child’s progress is measured by his or her own ability. The Montessori classroom is able to adapt to the individual needs of each child and offers diversity, stimulation and the opportunity to develop the person within the child. 4. Are Montessori schools religious? The Montessori philosophy itself is not religiously oriented. South Suburban Montessori School seeks to develop harmony within diversity. The celebration of holidays and traditions is another learning experience for sharing customs and food from around the world. 5. How will my child adjust to a traditional school after attending a Montessori school? Studies show that generally Montessori children adjust well and are often among the the best students in any environment. They spend their time more productively, are self-directed with a positive attitude towards learning, and are able to socialize effectively because of the benefit of multi-age classrooms and the respect they have learned for themselves and others. 6. Is the child free to do as he/she pleases? Although Montessori respects the uniqueness of each child, emphasizes independent work choices and encourages children to be their own advocates and develop their own tools for learning, there are clearly defined limits to this freedom. Each classroom also has basic ground rules which are based on respect for each other and for the environment. 7. If my child is left to choose his/her own projects, won’t he do the same thing day in and day out, or do nothing at all? 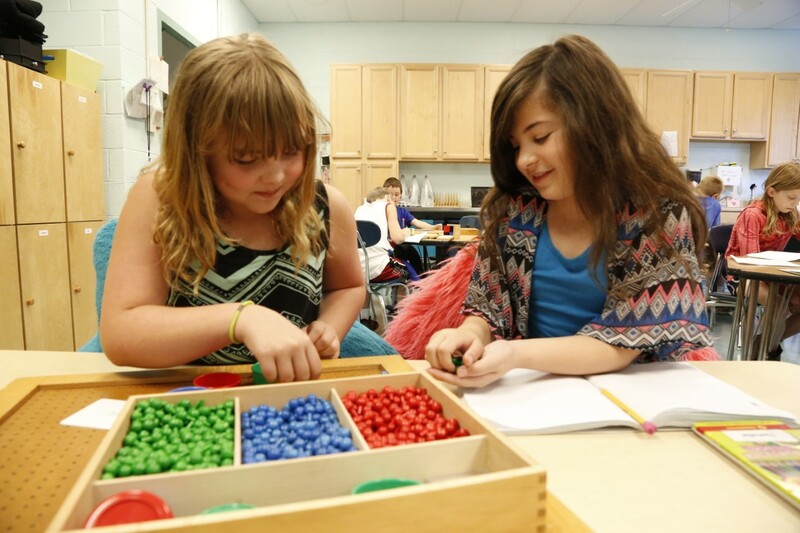 Our guides are trained to observe children as they work and respect the distinct abilities of each student. When a child has mastered a skill, the guide will give the child a lesson that is more challenging, giving attention to the age and interest of each child. The prepared environment offers many stimulating choices for students and they seldom ‘do nothing’. 8. Are lunches and snacks provided by the school? Every child is responsible for bringing their lunch to school. In the Toddler and Children’s House, parents volunteer to purchase snacks during the school year. A grocery list is prepared for parents. Snacks are available for children to individually prepare. 9. Why is a 5-day school week necessary for the younger Montessori child? The Montessori classroom experience is structured around five consecutive days, allowing spontaneous learning to flow smoothly. Children taken in and out of school every other day don’t have the opportunity to pursue their newfound interests. Consistency develops the social and working community of the class. 10. What is the role of the teacher? The function of a teacher (guide) in Montessori classrooms differs considerably from that of traditional ones. Rather than simply instructing, Montessori teachers prepare the children’s environment, guide their interests toward meaningful activities, stimulating them and ensuring they develop self-discipline. Montessori teachers require specialized training for their respective age group (e.g. infant and toddler, three to six year olds, etc). The training is comprehensive and thorough for specific developmental stages. 11. What is the Montessori Curriculum? The Montessori Curriculum was created for the developmental needs of each child and is presented in the form of diverse lessons as a child shows interest and readiness. The Toddler and Children’s House activities are geared towards facilitating independence, language acquisition, movement, exploration of the senses and nurturing the absorbent mind. The Elementary curriculum, also known as Cosmic Education, is boundless in its potential, offering experiences that connect students to the universe and the world they live in, while stretching their imagination toward creativity, morality and responsibility in society. Elementary classes are similar to a public school curriculum and enable children to transition into the mainstream schooling experience.